Show and Tell Meg: Crochet Update: Meet Fritz the Fox! 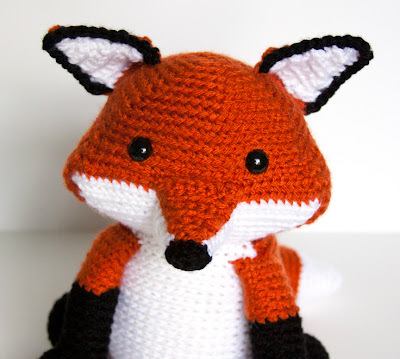 Crochet Update: Meet Fritz the Fox! I've had this pattern for a few weeks - I consider it a birthday present to myself :) - and I've been very excited to make it up, but I had to order the yarn for it so it had to wait for a while to get made up. I took a break from my giraffe this weekend to get this guy made and I just love it! This is Fritz and he's a fox :) Isn't he cute?! 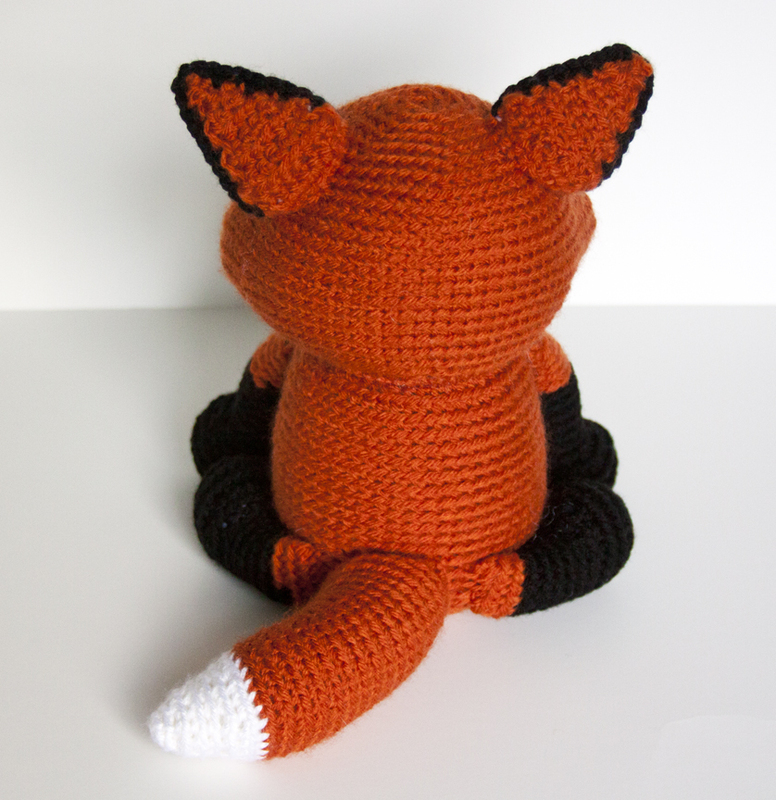 He was made from the Fabian the Red Fox pattern by Adrialys. I fell in love with him immediately. His pointed cheeks are my favorite part and I just had to have one. Look at his cute little face! I used Vanna's Choice yarn in Terra Cotta for the orange (to be honest it looked much more orangey-red online than it turned out to be in person, but it was close enough I guess so I went with it) along with Everyday Soft Worsted in black and snow white for the rest. I tacked down the back legs so they don't move, but the front ones can flop around. This comes in very handy for making him wave at people, lol, and my nephew loved it. Also, yet again these feet are the perfect size to fit right in Lucas' mouth which always means it's a win with him. And what fox would be complete without a tail? This one curves because that whole side is done with slip stitches. I like that it is constantly curved like that because he doesn't require a huge area to sit on. The slip stitches are never my favorite, but this time I made super sure to not pull them as tight as my other stitches and it went much easier. ERMEHGERD! It's so so adorable!! lol Thanks! I just love him :) He has a nice display spot in my sewing room because I just love to look at him. My husband thinks I'm nuts because I'll make it wave at him haha!